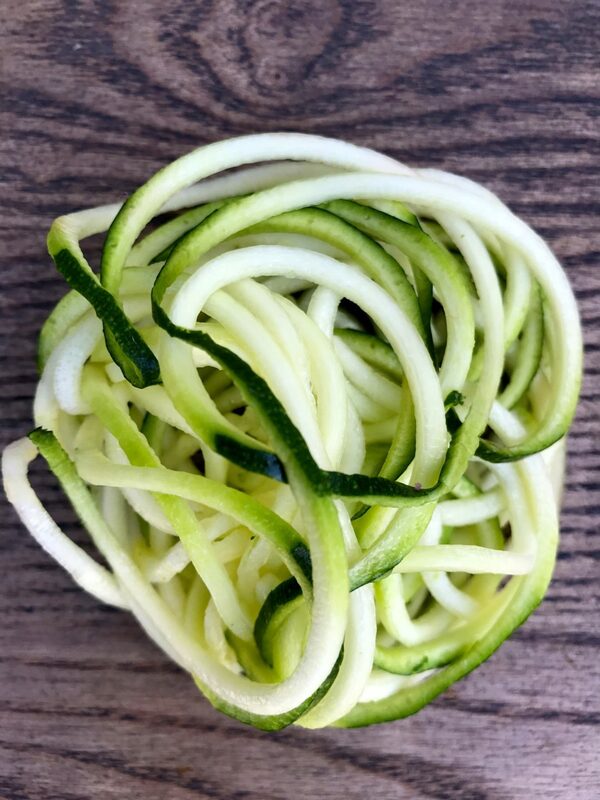 What The Heck Is A Spiralizer And How Do You Use It? A spiralizer is a kitchen gadget I recently purchased at Sur La Table. I will confess that it was a last minute purchase of a strategically-placed item near the check-out line. I didn’t need a spiralizer, there was no spiralizer when I was in culinary school, but in Sur La Table that day I decided I needed one. I actually love kitchen gadgets, and I enjoy getting them and giving them as gifts. Many kitchen gadgets are unnecessary and don’t improve the quality of your overall cooking experience. But they are fun. A spiralizer has recently become popular as part of the low carb health fad. It lets you make vegetable “pasta,” which can replace traditional pasta on menus. To be clear, I love pasta; but this is a nice, light, alternative. And anything that helps get my kids to try more vegetables is worthwhile in my book. The OXO Good Grip Spiralizer is the brand I purchased. So far I have been very happy with it. There is a strong suction cup on the bottom to stabilize it. 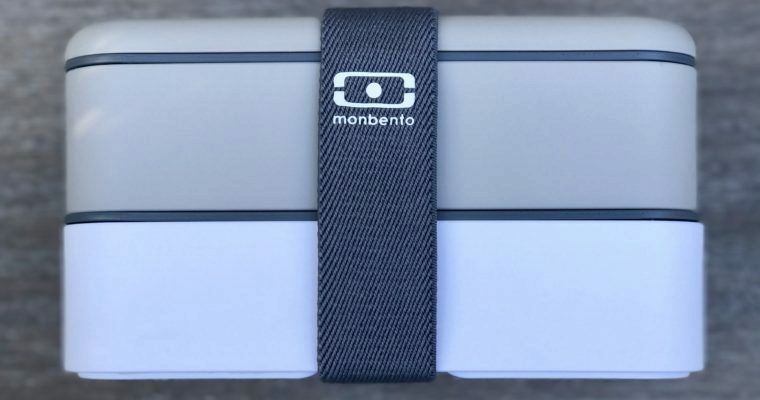 There are three color-coded interchangeable blades neatly organized in a storage container. Oxo refers to the blades as spaghetti cut (1/8th inch), a fettuccine cut (1/4 inch) and a ribbon cut. The unit is dishwasher safe. It’s easy to use. On one side is a crank that is attached to a plate with a series of plastic spikes protruding from it. When you place a piece of fruit or vegetable on the spikes, the crank lets you rotate it. The entire crank/plate piece can slide. 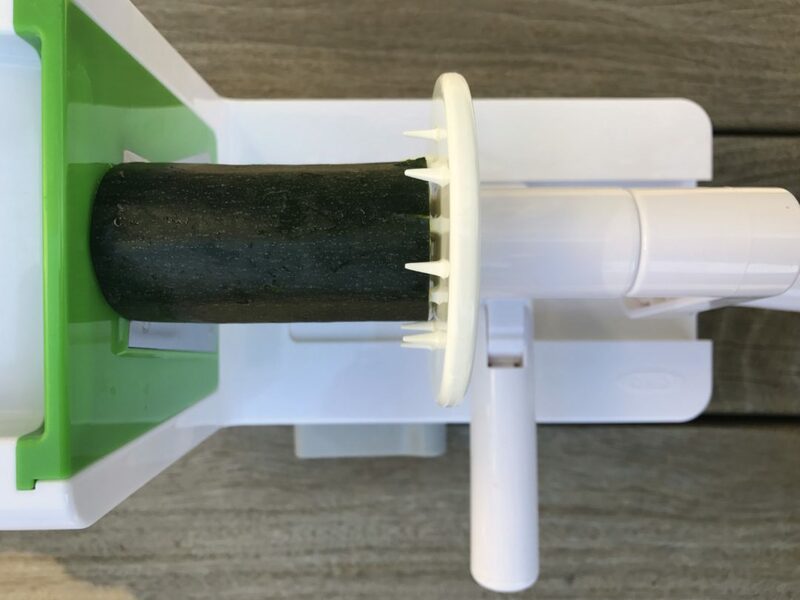 And to “spiralize” the piece of fruit or vegetable that you have impaled on the spiky plate, you slide the crank/plate toward the blades that sit on the other side of the unit. Out come beautiful long zucchini spirals, cucumber ribbons, and so on. Before this clever invention, a peeler or mandoline (also a favorite of mine, but a bit dangerous) would do the same thing. But this is more fun, and easy to use. This is also a great gadget to use with kids, even vaguely reminding me of my kids’ Play-doh press from when they were young. Today, my youngest son ate a huge bowl of cucumber ribbons, the whole time with a huge smile on his face (he always was a huge Play-doh fan). Zucchini spaghetti ribbons, like those pictured above, go great with my simple tomato sauce recipe. 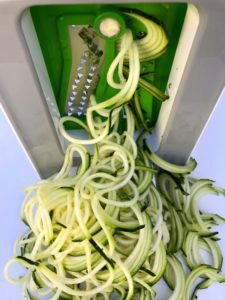 The spiralizer I purchased is currently available at numerous stores, including Amazon, and costs around $40. 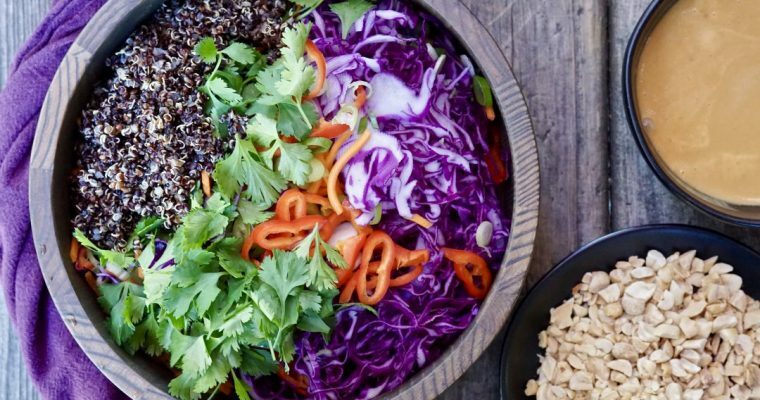 If you’re intrigued, a great food blog inspiralized.com (specializing in spiralizing food) is worth checking out for inspiration and recipes. 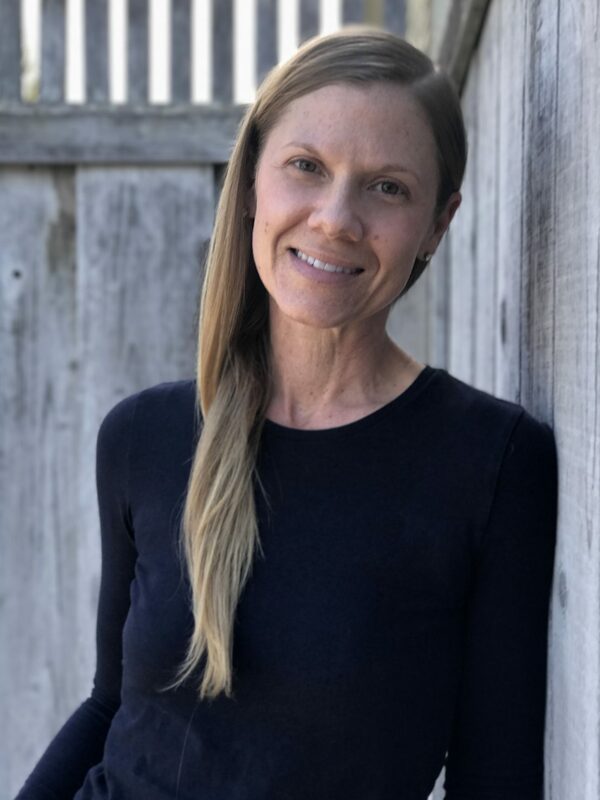 Your blog is absolutely gorgeous!